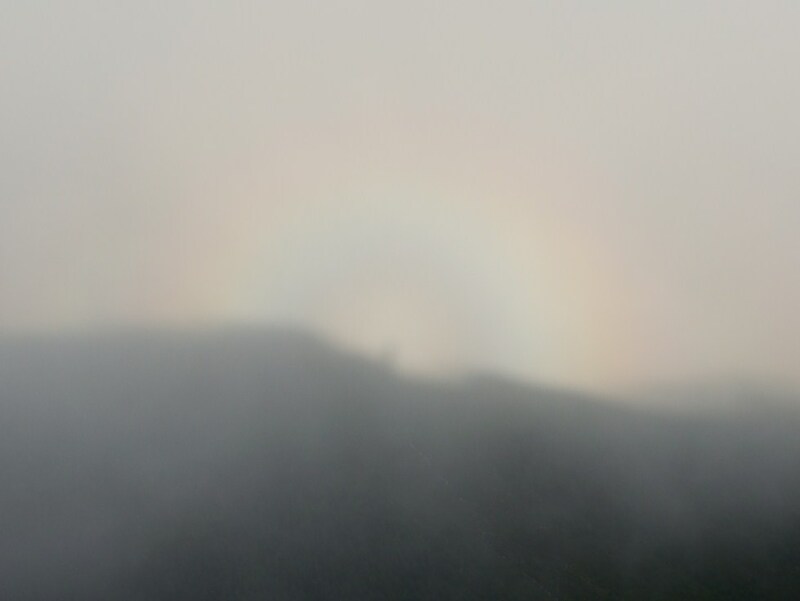 Light diffraction visible during the daylight with very low aperture and extremely short exposure. 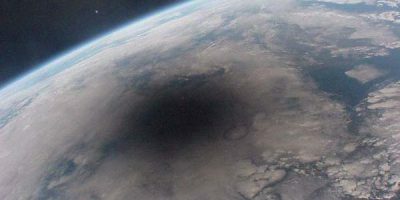 My deep interest of the light scattering in Earth’s atmosphere arose out of my observations of behaviour of the Earth’s atmosphere, especially around sunrise, sunset (golden hour, blue hour, twilight) and during the eclipses. I like to observe the weather phenomenas and atmosphere response for environmental phenomenas both live and remotely. Due to this I would like to describe the general light scattering phenomenon in this series of pretty long articles, knowing that the interaction of light with matter is one of the most fundamental processes that occurs in nature. Most of light we see reaches our eyes in an indirect way. Looking at a tree or a house, we see diffussely reflected sunlight. Looking at a cloud, or at the sky, we see scattered sunlight. Even an electric lamp does not send us light directly from the luminous filament but usually shows only the light that has been scattered by a bulb of ground glass (Hulst, 1981). The light, seen by us in direct way is definitely sunlight and moonlight. Sometimes, especially in areas free of light pollution we can experience a weak light coming from the brightest celestial objects like Venus or starlight in general. This is a subject for consideration in the future articles then. Earth’s atmosphere consist a lot of substances commonly known as air, which scatter and absorb the light, that both come from the space and terrestial sources of illumination. Moreover the way of scattering and absorption changes in terms of the astronomical and weather conditions. If you are reading this text you are in the right place, that bring you the general knowledge about these issues. The wavelength of visible light is quite small. A typical human eye will respond to wavelengths from about 390 (deep violet color) to 700nm (deep red color) (Starr et all., 2006). This is a small range within solar radiation spectrum with the highest spectral irradiance (Pic. 1). Pic. 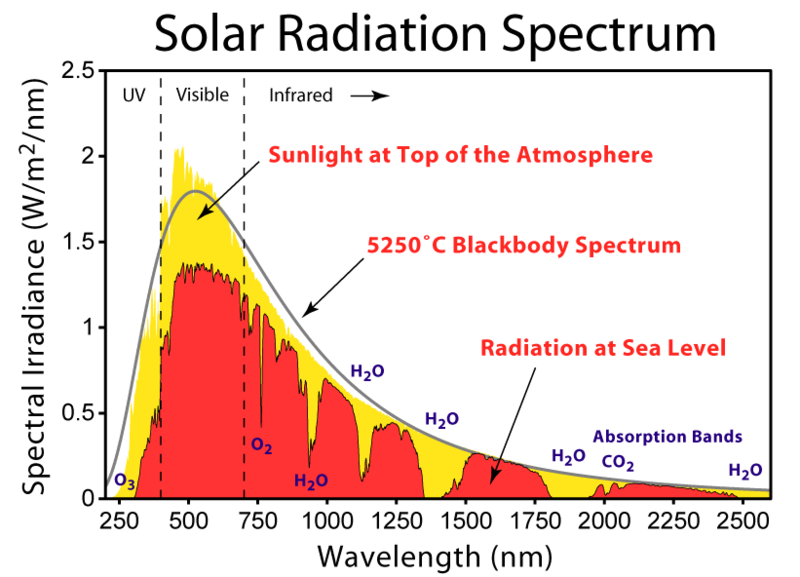 1 The solar radiation spectrum chart (wikimedia.org). Any simple wave of light take part in the complicated environmental events, that are all optical phenomenas. Once light enter the atmosphere can be scattered, reflected, refracted and diffused. Let’s take a look on the interaction of light with small particles. For better understanding this process I have brought the quantum theory of light. Quantum theory of light has been created by Einstein in 1905. The theory says, that the light propagating through a vacuumcan be though as a stream of particles, called photons, that have a wavelike properties. Matter is composed of atoms, the smallest constituent. When photons touch the matter we have a photoelectric effect. Photoelectric effect is the emission of electrons (photo electrons), when light shines on a material. When light encounters a surface or passes through a medium, inevitable interaction occurs between the light and the electrons of the atoms and molecules of the material (Flammer, 2013). Light is an electromagnetic wave, however according to corpuscular theory of light it has a dual nature. Both can also expand and radiate in all directions, carry energy and monentum and interfere with other waves. The interaction of electromagnetic radiaton with atoms and molecules is caled spectroscopy. There are various types of spectroscopy depend on the frequency of light we are using. The atoms and molecules absorb the photons, thereby absorb their energy. Depending on the energy of the photon absorbed or emitted, different phanomena can occur. When the atom absorbs a photon of visible light, the energy of that photon can excite one of that atom’s electron to higher energy level (transition process). In order to occur this, the energy of the photon absprbed must be greater than (or at least equal) to the difference of energy between the 2 energy levels. See the movie below to get what’s going on. The transition process can be shown on the graph in order to easier understanding of the colors our surrounding. The picture below (Pic. 2) shows the different energy level transitions posible for hydrogen atom. When the larger transition occurs between energy levels, the more energy is absorbed or emitted. Pic. 2 Excited electrons falling down to the 2nd level in the hydrocarbon atom will emit photons of different frequencies, thus different colors of light. Higher frequency photons are associated with large energy transitions (the highest levels). For example, when an electron falls from the level 5 will emit a photon of blue light, the most common in Earth’s atmosphere (khanacademy.org). 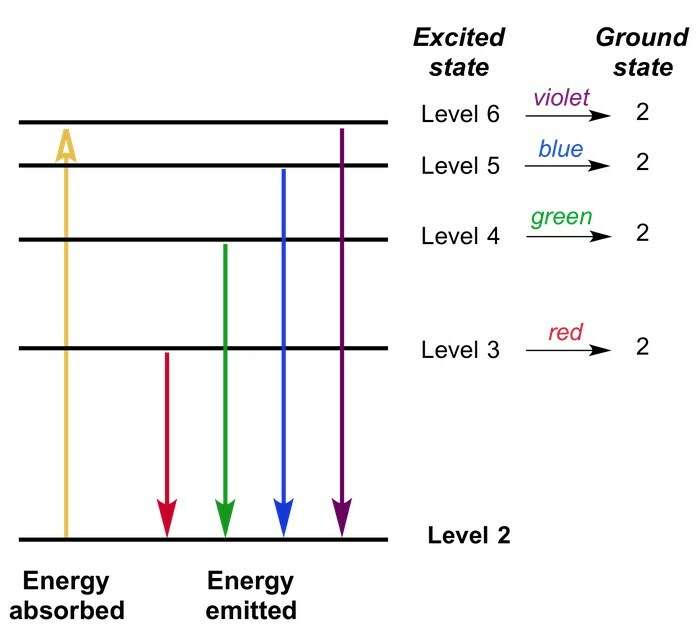 The energy transitions for the electrons of each element are unique and are distinct from one another. Therefore we can examine the colors of light emitted by particular atom and identify that element based upon its emission spectrum (Pic. 3). Pic. 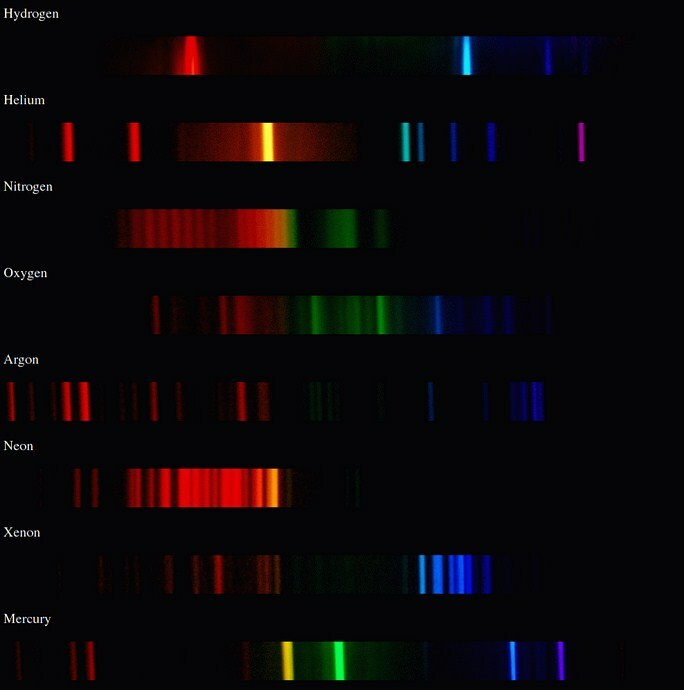 3 The atomic emission spectra for various elements (Khanacademy.org). There is basically two kinds of light scattering. Single and multiple scattering. – Single scattering occurs when radiation is only scattered by one localized scattering center. It simply take place, when light is scattered by one particle. This kind of scattering it can be treated as a random phenomenon and may refer up to 10% of total light scattering. For instance when light is scattered from one water droplet (or multiple droplets set apart), then we can say about single scattering. – Multiple scattering is very common in Earth’s atmosphere due to enormous amount of molecules and particles. The light beam is scattered by great amount of particles at once. Back to the droplet of water case, the multiple scattering will take place, when light is scattered from one droplet and then scattered from another and repeatedly from yet other droplets. 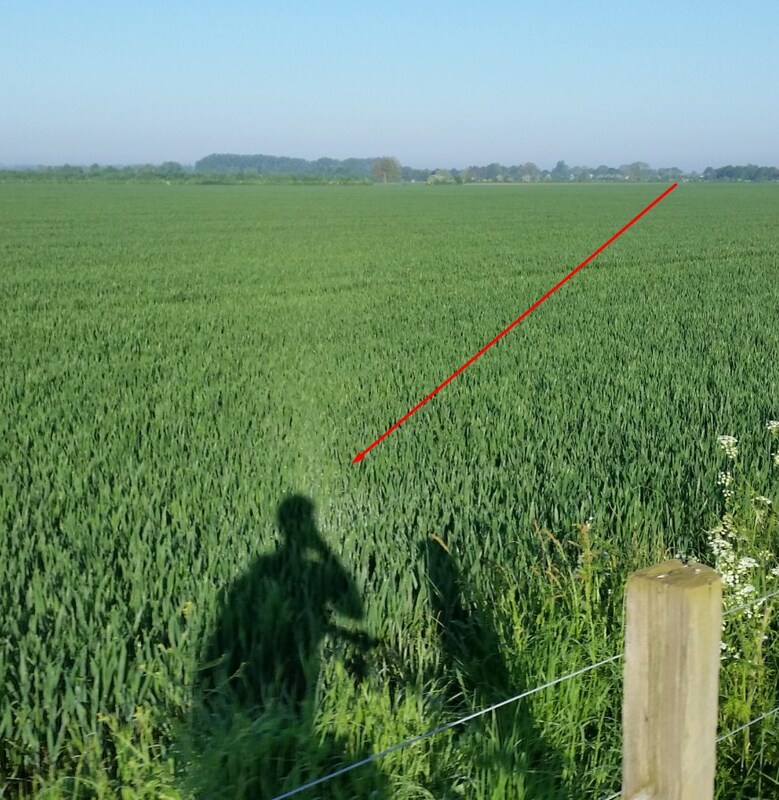 Another example of multiple scattering we can find during twilight conditions or when observe the phenomenas outside the Earth’s atmosphere like zodiacal light as an effect of scattering of sunlight by interplanetary dust spread throughout the Solar System (Pic. 4). Pic. 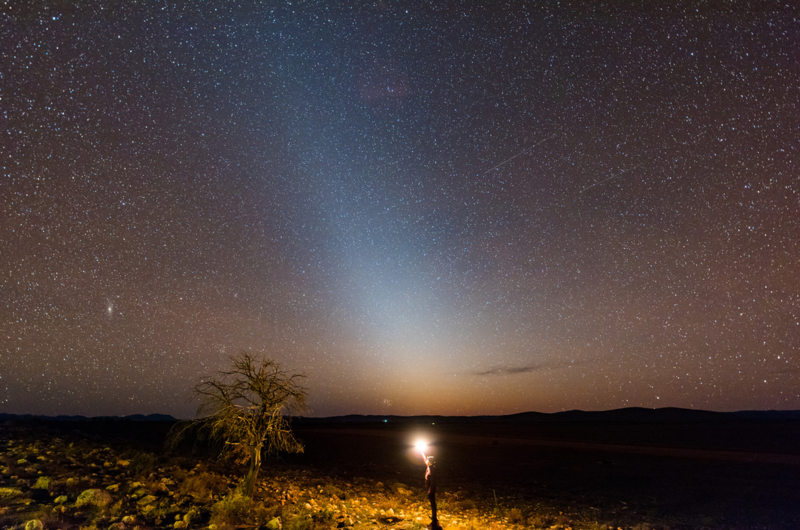 4 Zodiacal light is a good example of multiple light scattering of sunlight by the interplanetary dust (credits: Ian Inverarity, flickr.com), Hawker, South Australia. It is important to understand the difference between scattering, absorbtion, extinction and transmission. The interaction of light with matter entails the interaction of single atom with a single quantum of light (photon). In moment, when atom interact with photon the three things may happen. This is absorption, scattering, extinction and also transmission. Scattering – is a process, where a light photons are forced to deviate from straight trajectory by one or more paths due to localized non-uniformities in the medium through which they pass. Imagine then one beam of light, which is sunsequently divided to go towards multiple of directions (Pic. 5). Pic. 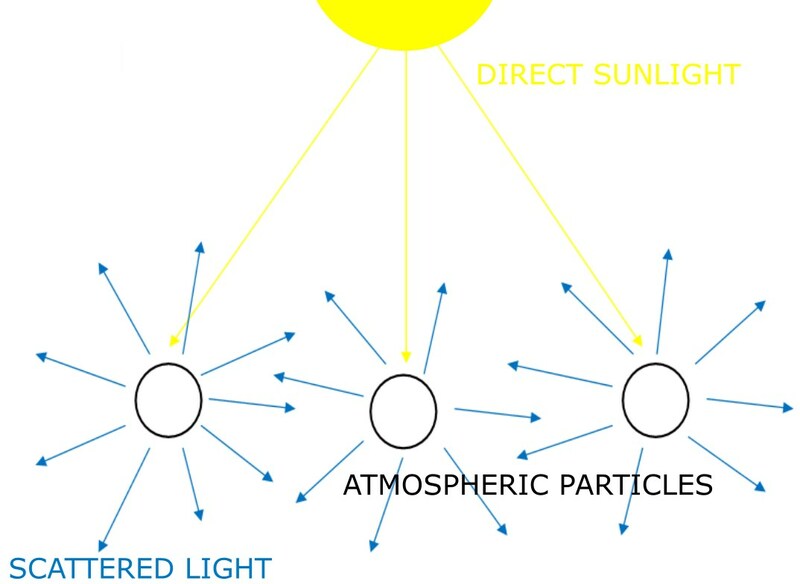 5 The simplified model of light scattering in the Earth’s atmosphere. When direct sunlight encounters the small molecules it’s being scattered in all directions. Absorption – is the way in which the energy of a photon of light is taken up by matter (Pic. 6) and then transformed into energy. The absorption of light waves depends on the electromagnetic frequency of the light and object’s nature of atom. Absorption depends on the state of an object’s electron (Hulst, 1981). All electrons vibrate at a specific, their natural frequency. Hence we have a different colors of objects, because each object has its own natural frequency of light (Pic. 2). Some parts of the light are absorbed to the object, which at the outcome gives a thermal energy and some are reflected in certain wavelengths (Pic. 7). Pic. 6 The light wave behaviour between vacuum and medium (or between two mediums with different density) with phenomenas associated with: reflection, refraction, absorption and transmission. Some objects absorbs all light wavelengths like dark objects, hence these objects are the warmest when exposed on the source of light. 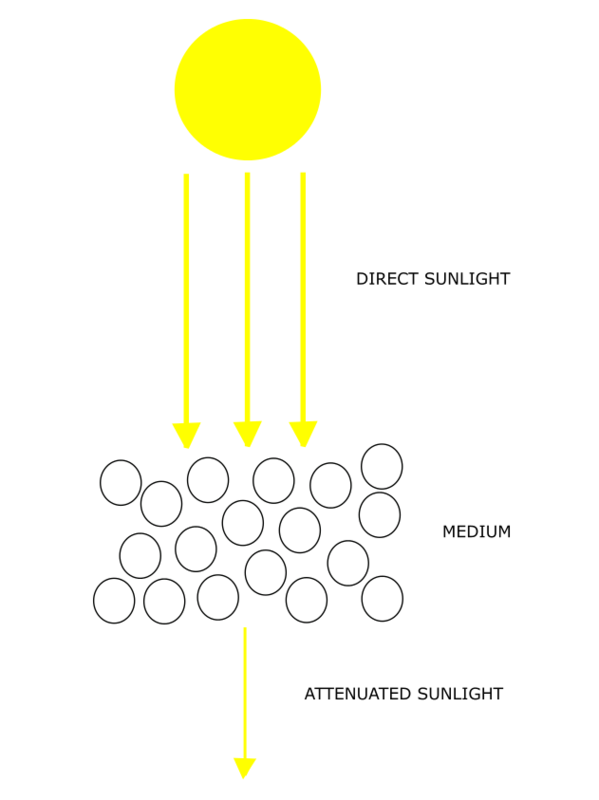 Light absorption is often accompanied by scattering. We can also say, that leafs looks green, because it scatters green light more effectively than red light. Pic. 7 Some interactions of light with media (Flammer et all., 2013): a) refraction – in dense medium light changes direction and travels more slowly; b) non color-selective scattering (milk); c) absorption without scattering (clear medium), where after absorption of blue the remain ray of light is yellow; d) absorption of blue and green, where red color remains. Extinction (or attenuation) – is a graduall loss of light intensity through a medium (Pic. 8). The extinction is a sum of scattering and absorption because both scattering and absorption remove energy from a beam of light traversing the medium (Hulst, 1981). Best example is the Sun, which is much fainter during the sunrise or sunset than during the noon. Pic. 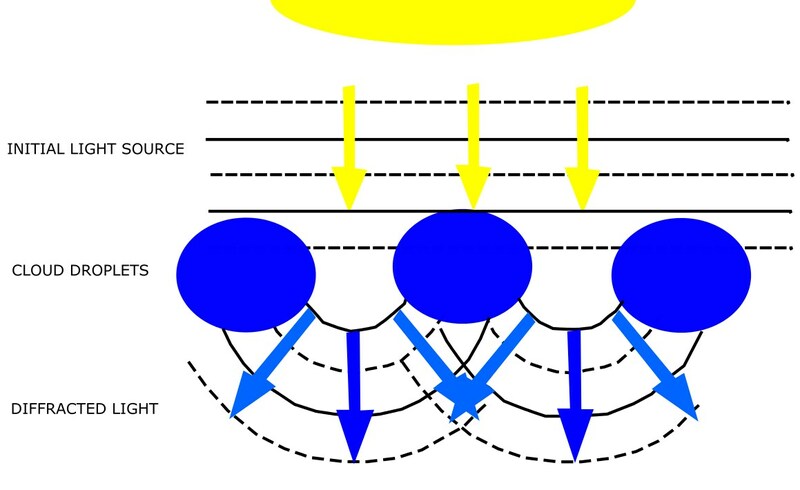 8 The simplified model of light extinction (attenuation). Light, that encounter a small molecules in medium is partially absorbed and attenuated then. Transmission – is the way of light through transparent or semi-transparent medium without being absorbed (Pic. 7). The transmission inform us about proportion of the incident light, that moves all the way through the material (medium). Best example of light transmission is Earth’s atmosphere, where light coming from space (vacuum) proceeds through the gaseous medium all the way down to the surface (observer). Rayleigh scattering – this is the most common light scattering present in Earth’s atmosphere, that relates to the smallest particles, usually much smaller than light wavelength. Wait for the next article to learn more about this kind of scattering. Mie scattering – another common type of light scattering in the Earth’s atmosphere, that occurs when particles are more or less equal with light wavelength. In this case we speak about atmospheric aerosols. This is also the topic to develop in the further writings. 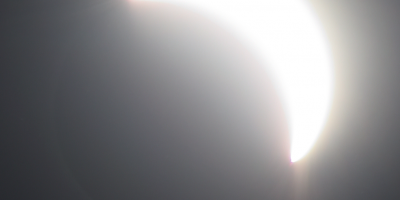 Non-selective scattering – is often confused with Mie scattering, because refers to the bigger particles. Non-selective scattering occurs, when the particles are much larger than the wavelength of the radiation. Thi type of scattering can cause water droplets and large dust particles. Unfortunately you will not know more from this article, because it will be described separately. Brillouin scattering – scattering refers to the interaction of light and material waves within a medium. This kind of scattering involves inelastic scattering of light caused by the vibrational properties of matter. The Brillouin scattering occurs on sound waves, which propagates in solid. This kind of scattering enable us to set the sound velocity. Raman scattering – is the inelastic scattering of a photon by molecules, which are excited to higher vibrational or rotational energy levels. When photons are scattered from an atom or molecule most of them are elastically scattered, so they have the same energy (frequency and wavelength) as the incident photons. A small fraction is scattered inelastically having a different energy and frequency and usually lower than those of incident photons (Harris, Bertolucci, 1989). The Raman scattering can be used in setting the temperature of scattering object. First 3 types (Rayleigh, Mie and non-selective)) belongs to elastic scattering, in which energy of radiation is not changed due to scattering. Another 2 types (Brillouin and Raman scattering) represents the inelastic scattering, where the energy of the scattered radiation is changed. In inelastic energy some or all kinetic energy of light is absorbed due to colission with solid or particles. The direction of light changes when the wavelength touch the surface. Depends on the surface. Important is law of reflection, which says that the angle at which the wave is incident on the surface equals the angle at which it is reflected (Pic. 9). Pic. 9 A graphical representation of the law of reflection (study.com). – specular reflection (so-called mirror like reflection), which clearly correspond with the law of reflection (Pic. 9). In this case light scattered is in the opposite direction of incident light. This can be seen on surfaces such as mirrors or a calm body of water (Pic. 10). Pic. 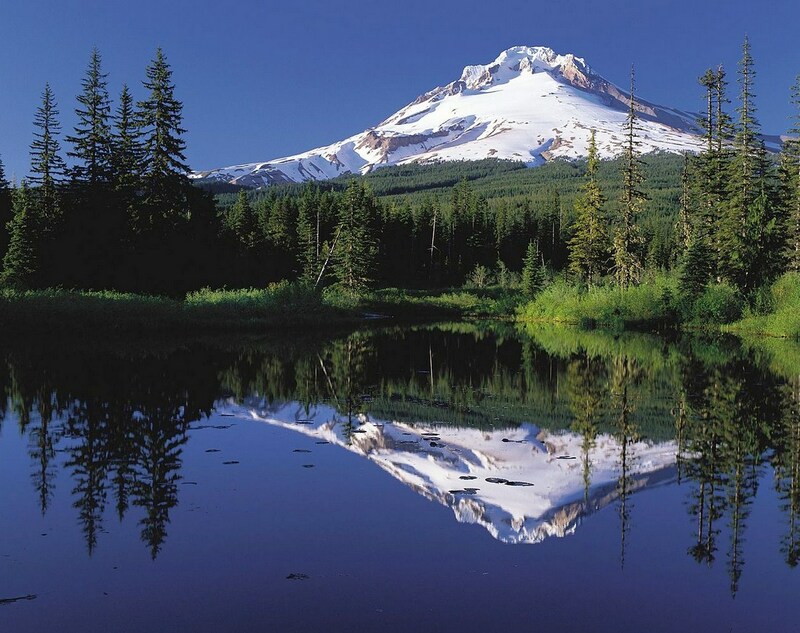 10 The reflection of Mount Hood in the Mirror lake as a perfect example of specular reflection (wikimedia.org). – lustrous reflection, which is something else between specular and diffuse reflection. It occurs, when the surface is almost ideal, however some smallish roughness exist. A part of the light can be reflected specularly, another part may bereflected diffusely or scattered (Denham, Lonsdale, 1924). A good example of it is paper or some lustrous metals like platinum, gold or iridum (Pic. 25). – diffuse reflection, that is much more common because it takes place when the surface is not ideal. Roughness causes a multiple reflections and scattering in different directions (Pic. 11, 12). Pic. 11 Two types of reflection: specular reflection and diffuse reflection, which are depend on the surface (wikimedia.org). Pic. 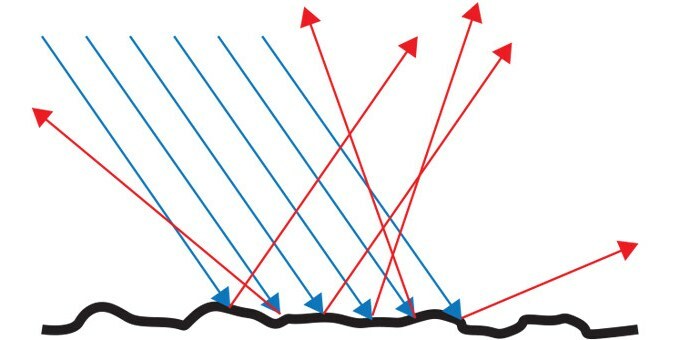 12 The graphical representation of the diffuse reflection (oce.oceanoptics.com). 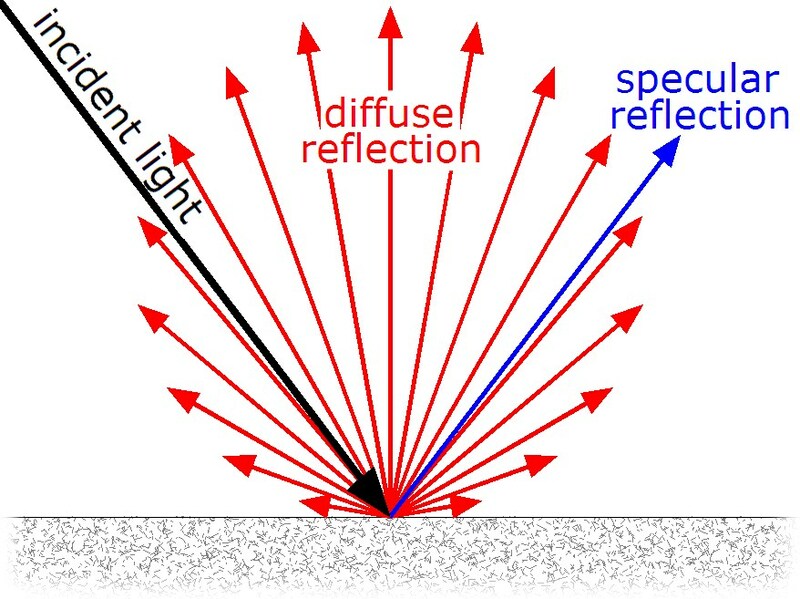 The exact form of the diffuse reflection depends on the structure of the material. Both scattering and reflection occur and overlap, however there is simple difference between each other (Pic. 13). The main factor controlling them is particle size. When particles are smaller than light vawelengths then we have scattering. Once the particle size is bigger than light wavelength then we have a reflection Phenomena. Pic. 13 General mechanism of diffuse reflection by a solid surface with exclusion of the refraction factor. 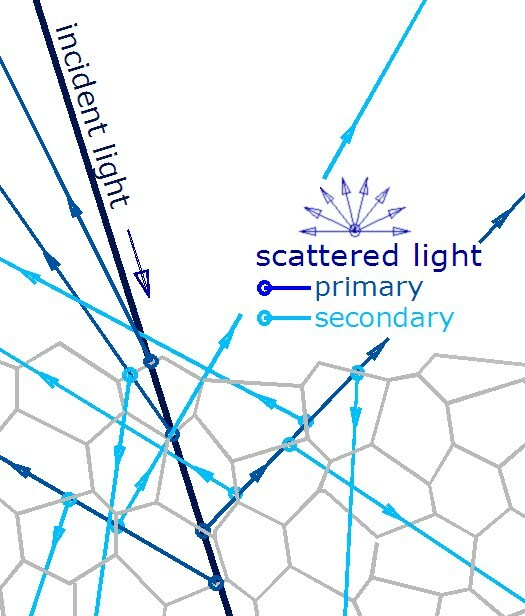 Light can be also secondary scattered (wikimedia.org). The light reflected from some object, which in the atmosphere can be cloud (built by small water droplets, but bigger than light wavelength size) will fall within the absorptivity (Beer-Lambert law). It arises out of the attenuation of light travelling through the atmosphere. We can see it in the cloud cover perspective, when further clouds looks fainter (during hazy conditions) (Pic. 14 – 16). Reflection is much easier observeable. Pic. 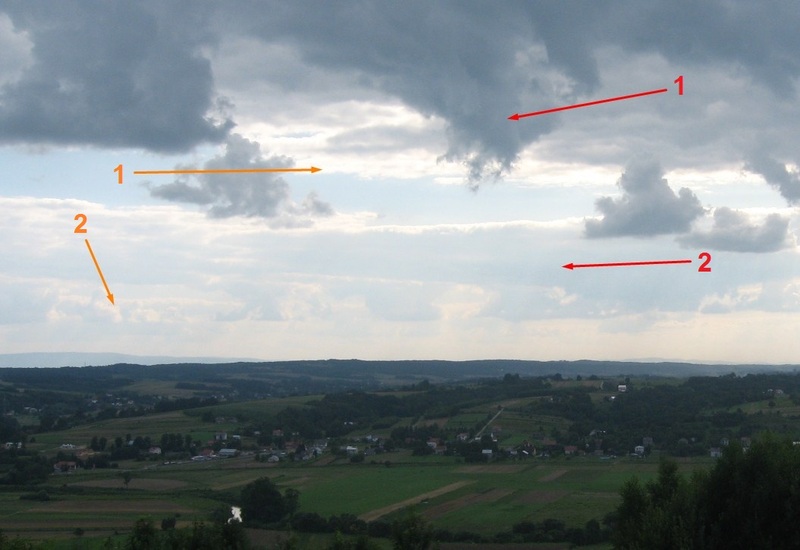 14 Reflected light attenuation in Earth’s atmosphere during hazy condition in case of low level and mid-level clouds (Cu, Sc), where 1 represents shaded and sunlited cloud closer and 2 further, Kobyle, Zawada Hill, Poland. Pic. 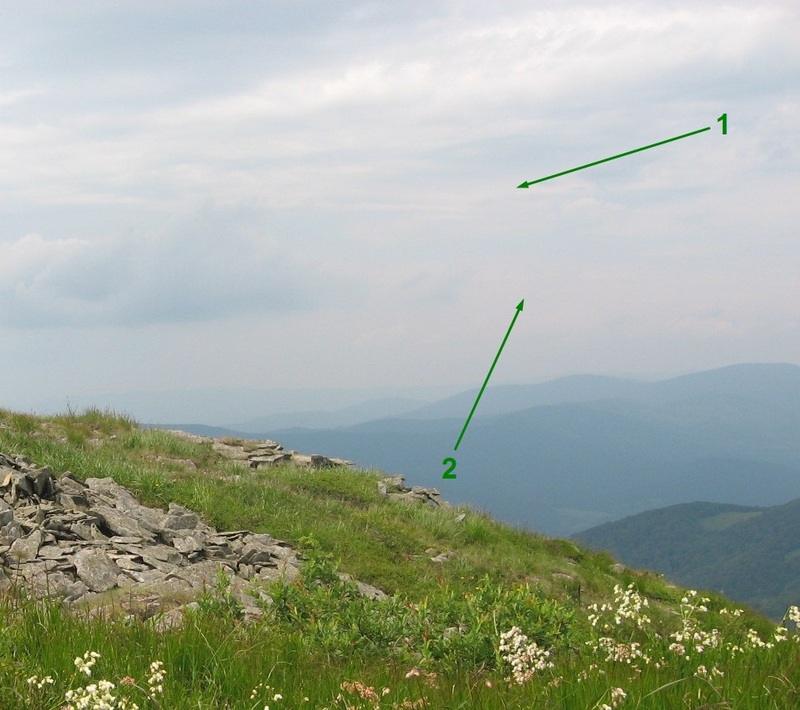 15 Reflected light attenuation in Earth’s atmosphere during extremely hazy conditions in case of mid-level clouds (Sc), where 1 represents closer cloud layer and 2 separate further cloud layer, Tarnica, Bieszczady, Poland. Pic. 16 Reflected light attenuation in Earth’s atmosphere during near Rayleigh scattering conditions is not clearly visible. 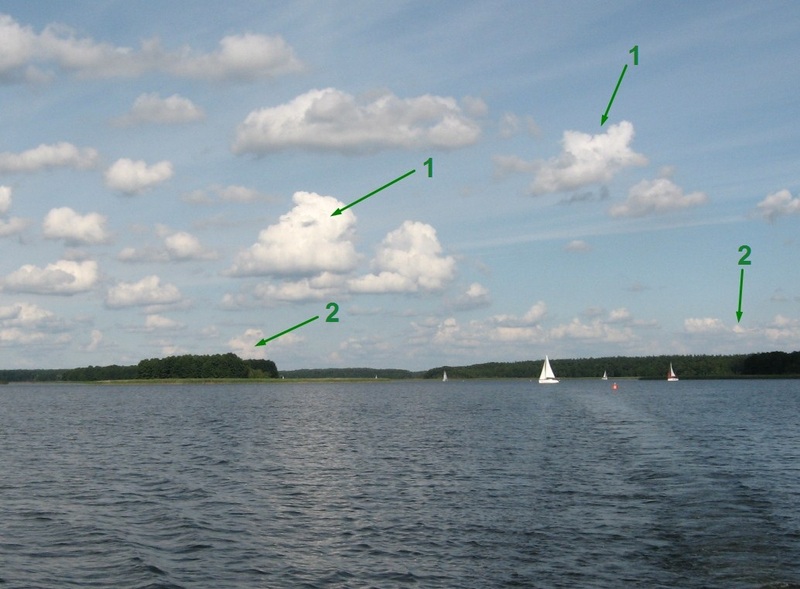 All clouds appears to look the same, just clouds situated closer to horizon (marked no 2) appears to look a little bit yellowish, The Niegocin Lake, Wilkasy, Poland. Refraction is the change of direction of wave propagation due to a change in its transmission medium (Pic. 17). The transmitted light appears to travel slower through the dense medium. For example, wave in the air will travel faster than in the water. When the ray of light will enter from the air to the water is bended. The velocity of the light wave changes unlike to the frequency, that remains constant. Refraction is less related with scattering than another phenomenas because its mechanism is quite different. Refraction occurs when a large number of dipoles scatter coherently. Each individual particle scatters light in response to the incident radiation in almost all directions. We have to know, that there is a large collection of these scattered, whereas each one scattering the light in each direction. The contribution of each scatterer interferes with every other contribution against the total field. Reassuming the main difference between light scattering and light refraction is that scattering refers to small scatterers and refraction requires a large number of scatterers and a clean interface too. 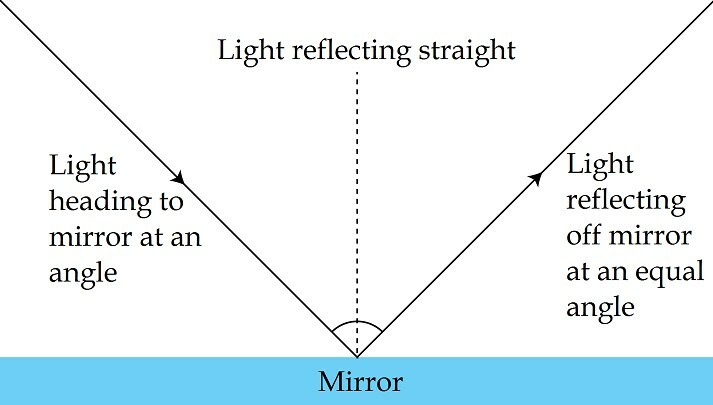 There is much more details, as we can get to know about the light refraction. I am planning to develop this topic in the future. Diffraction is the slight bending of light as it passes around the edge of an object. The amount of bending depends on the relative size of the wavelength of light to the size of the opening. When opening is much larger than the light’s vawelength, the bending will be almost unnoticeable. In the atmosphere diffracted light is actually bent around atmospheric particles – mainly a tiny water droplets found in the clouds (Pic. 18). Pic. 18 A graphical representation of the light diffraction phenomena, that occurs on smallish water droplets in Earth’s atmosphere. Diffracted light results the interference effects. Diffracted light can produce fringes of light and dark or colored bands. 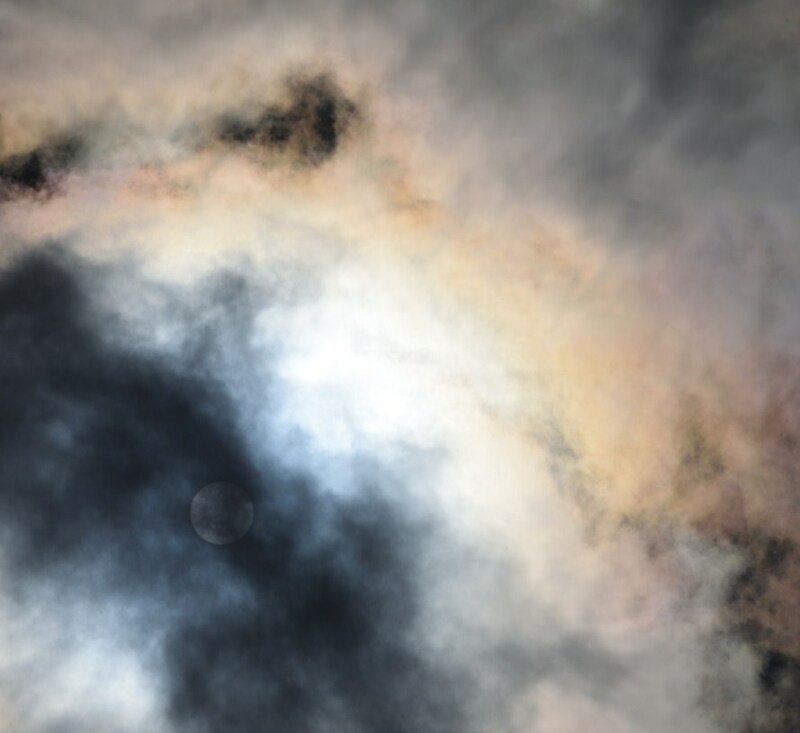 An optical effect that results from the diffraction of light is the silver lining sometimes found around the edges of clouds or coronas surrounding the Sun or Moon (Pic. 19). Pic. 19 An optical effect of light diffraction seen on cumulus clouds in sunlight. Because is impossible to see it unaided eye I used extremely short time exposure and minimum aperture: 1/4000s F20 to make this picture. Basic difference between diffraction and scattering is that the diffraction is a phenomenon observed only in waves unlike to scattering, that can be observed in both waves and particles. 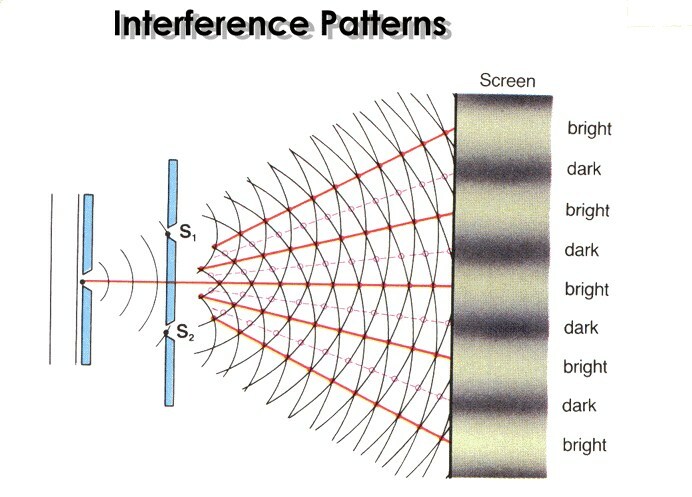 Light interference is an output of the diffraction. In common case, when sunlight or moonligh encounters a cloud droplet, light waves are altered and interact with one another. It works likewise in water waves, where the incident waves touch the flow. At the outcome the flow start producing waves on its own, that spread in all directions and interact in other waves. If the crest of two waves combine, an amplified vawe is produced (constructive interference). In the opposite case, when the crest of one wave and a through of another wave combine, they cancel each other to produce no vertical displacement (destructive interference). Back to light waves the constructive interference will cause the light appear brighter. When destructive interference the light either appear darker or dissapear entirely (Pic. 20). Pic. 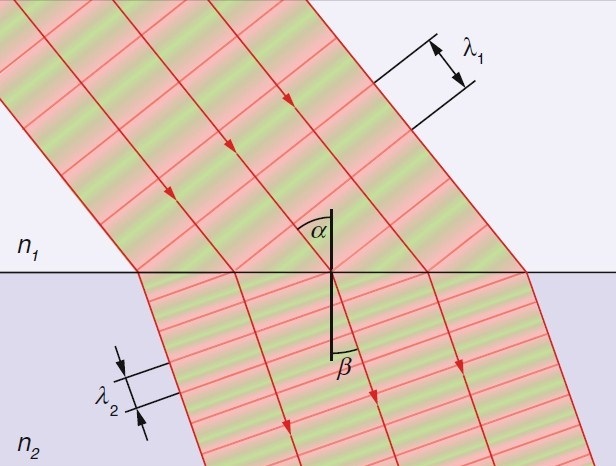 20 The interference mechanism (physics.stackexchange.com). Light interference can produce phenomenas with a combination of diffraction, reflection and scattering (or backscattering) like solar glory (Pic. 21). Pic. 21 Solar glory above the Ennerdale Valley in Lake District National Park. Interference, similarily like diffraction can be observed only on waves unlike to scattering, that can be observed on waves and particles. Dispersion is a special case of scattering, where all wavelengths are scattered proportionately and evenly. Dispersion is the phenomenon, in which the phase velocity of a vawe depends on its frequency (Born, Wolf, 1999). The best example of light dispersion in Earth’s atmosphere is a rainbow phenomena (Pic. 23), that is caused by rain drops. These rain drops plays a role of dispersive prism, where the light is scattered evenly from white light to several color of spectrum, that we can call simply VIBGYOR. VIBGYOR means Violet, Indigo, Blue, Green, Yellow, Orange and Red (Pic. 22). Pic. 22 The graphic representation of the dispersion phenomena (funscience.in). Prism can be a drop of water as well as glass. Dispersion means, that the higher frequency light bends more in the prism. Pic. 23 The beautiful rainbow above Loch Ness. This is also the issue, that I will describe in forthcoming articles. Basically I would like to show you optical effects related to scattering, caused by haze, clouds and surface. Watching the surface we can spot some optical effects. One of them is the mirror effect, when light is reflected from the plain surface like lake (Pic. 10). Another noticeable one is the opposition effect (called also shadow hiding). When looking in a direction away from the Sun, shadows are hidden by the objects casting them (Pic. 24). Pic. 24 The shadow hiding phenomena. When grass is dew wetted then we can experience a holy light (our head will be enveloped by sprinkling white glow). The antisolar point appears to be brighter. Finally this area appears to have a larger number of scattering centers. The light scatters preferentially back the way it came reaching a local maximum in the backward direction. This is the retroreflection phenomena called coherent backscatter. It occurs on rock minerals. Another example refers to the general interaction of light with the surface (Pic. 25), where the colour of initial ray of light is to be modified by colour of the local surface through the absorption properties of this surface. At the outcome the scattered light has a different color than initial one. Pic. 25 The interaction of white light with surface. Considerating a white light (the easiest example) in interaction with the surface can produce an optical effects as follows: a) specular reflection, b) lustrous reflection by paper with a sloghly rough surface, c) diffuse reflection from whitewashed wall, where no absorption d) diffuse reflection with absorption of the shorter wavelengths at a painted yellow wall (Flammer et all., 2013). 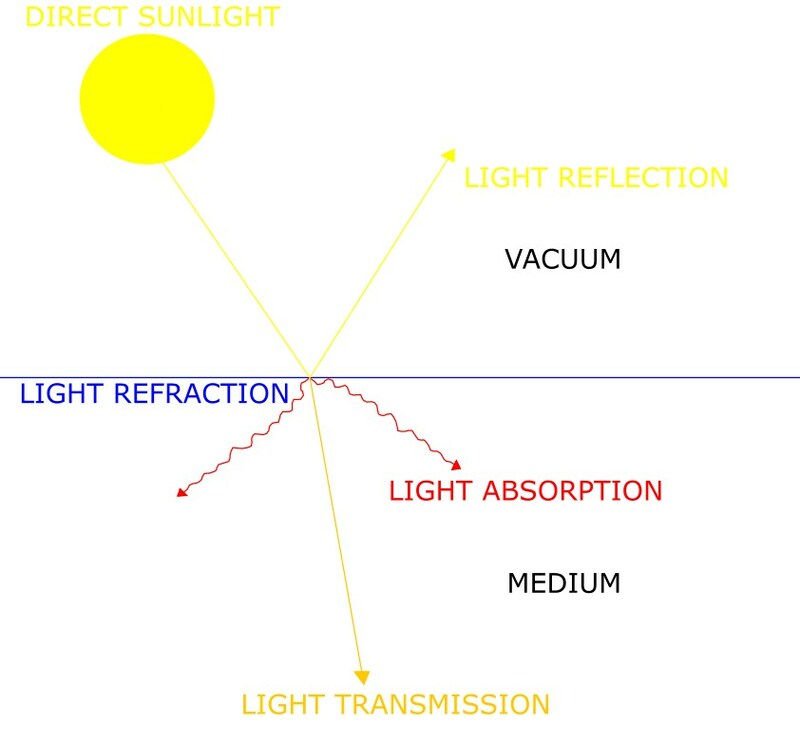 The picture above shows the summary of the reflection of light issue and the optical phenomenas related with. The light scattering in the Earth’s atmosphere is very wide topic strongly associated with another light phenomenas as well as the atmospheric optics. Due to this is really hard to distinguish solely light scattering itself not to mention about reflection or refraction. Hence these processes are often confused. The scattered light is a part of huge atmospheric optical phenomena, that contributes to general response of all substances, molecules and aerosols included. Treat this article like an introduction to huge presentation of atmospheric properties, that impact of light distribution and visibility properties in your area. 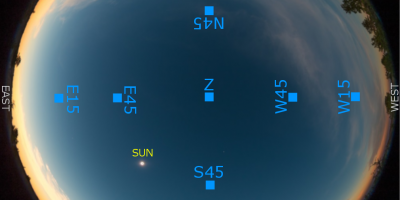 Having this big knowledge you will be able to point the best moment to conduct the observation of the night sky, observe the atmospheric phenomenas or take a photo of remote object from your area.